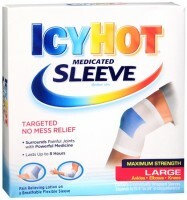 Heading Icy to dull the pain, hot to relax it away. Directions Adults and children over 12 years: Remove backing from patch by grasping both ends firmly and gently pulling until backing separates. 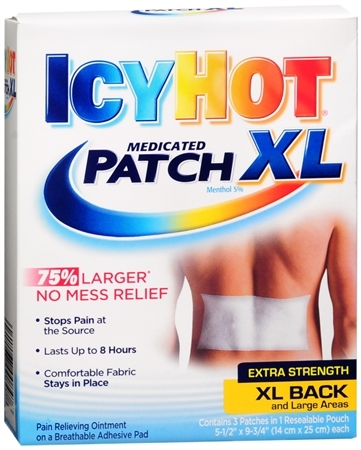 Carefully remove smaller portion of backing from patch and apply exposed portion of patch to affected area. Once exposed portion of patch is positioned, carefully remove remaining backing to completely apply patch to affected area. Apply one patch to affected area. 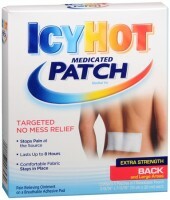 Wear one Icy Hot Patch up to 8 hours. Repeat as necessary, but no more than 4 times daily. Children 12 years or younger: ask a doctor. KEEP CARTON AS IT CONTAINS IMPORTANT INFORMATION. Uses Temporarily relieves minor pain associated with: arthritis, simple backache, bursitis, tendonitis, muscle strains, muscle sprains, bruises, cramps. Pain relieving ointment on a breathable adhesive pad. 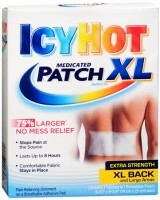 For extra large back and large areas. 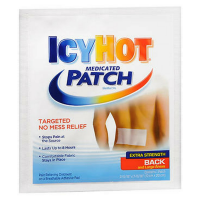 Extra large patch measures 5-1/2 inches x 9-3/4 inches (14 cm x 25 cm) each. Contains 3 patches in 1 resealable pouch. Warnings For external use only. When using this product: use only as directed; do not bandage tightly or use with a heating pad; avoid contact with eyes and mucous membranes; do not apply to wounds or damaged skin, broken or irritated skin. Stop use and ask a doctor if: condition; redness is present; irritation develops; symptoms persist for more than 7 days or clear up and occur again within a few days. If pregnant or breast-feeding, ask a health professional before use. Keep out of reach of children. If swallowed, get medical help or contact a Poison Control Center right away.